Disregard for Islam’s early history is due to Saudi regime’s adoption of Wahabism. This is just plain wrong but, whoever could imagine much right about the mad mullahs of the Islamic poison called Wahhabism.? Three of the world’s oldest mosques are about to be destroyed in Medina as Saudi Arabia embarks on a multi-billion-dollar expansion of Islam’s second holiest site, according to the British Independent. The house of Mohammed's first wife, Khadijah, has already been replaced with a public toilet block, it reports. The disregard for Islam’s early history is due to the Saudi regime’s adoption of Wahabism, an austere stream which scorns all forms of idol worship, including shrines and pilgrimages to graves, the paper explains. Work on the Masjid an-Nabawi in Medina, where the prophet Mohammed is buried, will reportedly start once the annual Hajj pilgrimage ends next month. When complete, the development will turn the mosque into the world’s largest building, able to take in 1.6 million worshippers. But there are fears that the redevelopment of the Masjid an-Nabawi is "part of a wider drive to shift focus away from the place where Mohammed is buried," the newspaper says. "The spot that marks the Prophet’s tomb is covered by a famous green dome and forms the centerpiece of the current mosque. But under the new plans, it will become the east wing of a building eight times its current size with a new pulpit." Historic sections of Mecca and Medina have been bulldozed to make way for gleaming shopping malls, luxury hotels and enormous skyscrapers. The Independent quotes the Washington-based Gulf Institute, which estimates that "95 per cent of the 1,000-year-old buildings in the two cities have been destroyed in the past 20 years." 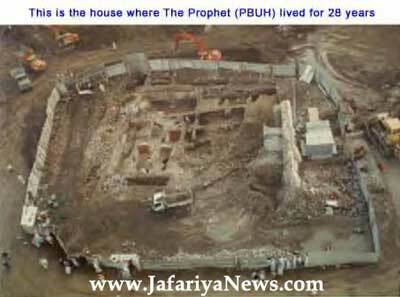 For more information on this and other desecration of Islamic holy sites in Saudi Arabia, please go HERE to read further. Blessings upon you in your work to redress injustice. Amen!